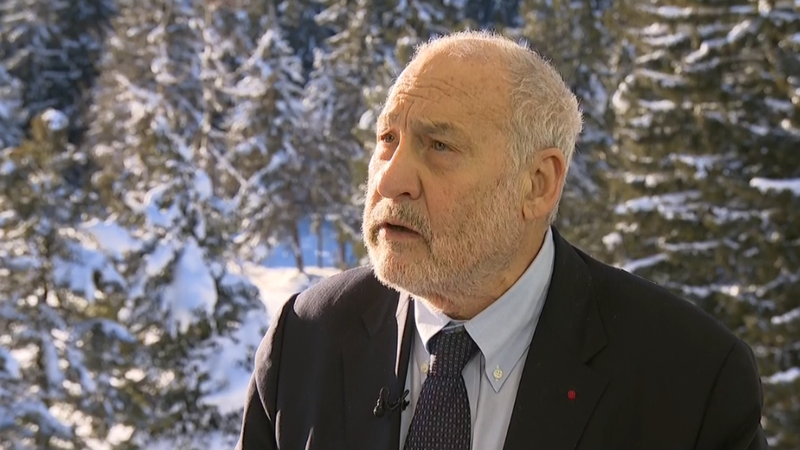 How unequal should America be? Take this inequality quiz. How unequal do you think the world is, really? And how unequal do you think it should it be? These are the questions Dan Ariely, a behavioral economist at Duke University, wants people to answer. He's designed a quiz app, titled "Fair Game? ", to assess what folks think a fair society should look like. Over the next month, the app will allow users to answer a total of 13 questions on wealth, health, gender, race, crime and education. Geared to an American audience, the app will feature three questions a week. Ariely will then break down the responses by age, gender and political leaning. But he's not using the data for an academic paper. He's hoping it will prompt users to ponder what type of society they want to live in. "This is to get people to reflect on the question," said Ariely. "We will post the answers and hope to get a discussion started." Researchers designed a quiz app on inequality. Ariely collaborated on the app with Michael Norton, a Harvard Business School professor, and David Grusky, director of Stanford's Center on Poverty and Inequality. Ariely and Norton's prior work on inequality became the subject of a 2013 viral video showing how skewed Americans' perceptions of how wealth is distributed in this country. 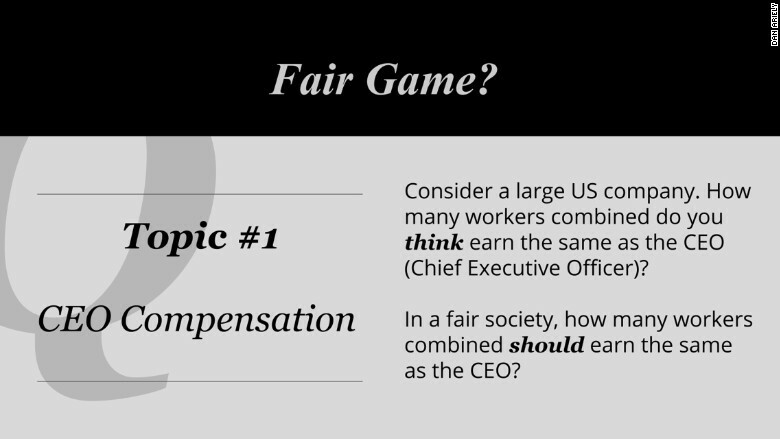 Some early results on CEO compensation from the Fair Game? app are already available. Ariely asked users how many workers combined should it take to earn as much as the CEO and how much does it actually take now. The results were way off. App users felt it now takes a total of 151 workers' salaries to make as much as a CEO, but it should only take a total of 72. The actual figure? A total of 303 workers' salaries, according to a 2015 report by the left-leaning Economic Policy Institute. Early results from Prof. Dan Ariely's Fair Game? app are in. Younger respondents, under age 30, estimate the wage gap to be wider than others do, but they also think it should be that way. 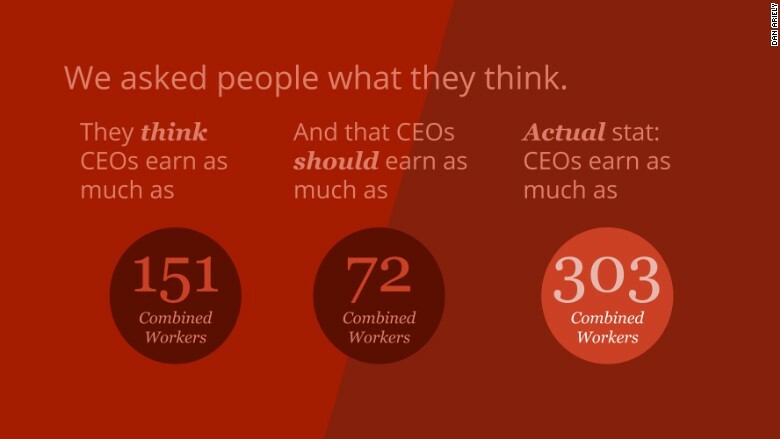 Men think the gap is wider than women do, but they both feel that CEOs should earn 72 times the amount of workers. Both conservatives and liberals feel similarly about the current wage gap, but liberals think CEOs should only take home 63 times what workers do. Conservatives feel 93 times would be more fair.